Special note: This game has a cameo appearance of the always happy round creature found in other games like The Guardian Legend and Golvellius: Valley of Doom. In my 6 part Stud of the Month series I gave a lot great and famous Nintendo Entertainment System games the award so far. Castlevania, Tetris, Life Force, Legend of Zelda, and Super Mario Bros. 3 were all high profile games for the machine and all deserved to remembered but despite how good these legends are here my favourite NES game is still the intense action/adventure title: The Guardian Legend. 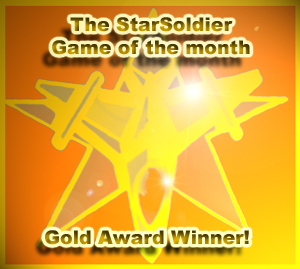 The problem is I already gave that Game of the Month a few years ago and there was never any sequel to it either. There was one NES game though that played a lot like it believe it or not and chances are most NES fans don't even remember it. The game is Nexoft's insanely challenging and fun shoot em up Gun Nac and it is the final game in the 6 part Stud Series. In this game the story focuses on seven peaceful planets from another solar system that have suddenly been under attack from many of their own resources. Because of this all the worlds are now in total chaos thanks to the craziest stuff like fish, coins, and even robotic rabbits. The planets are desperate for answers and they asked you (The Gun-Nac) to destroy anything in your way to find the cause of this problem. Sure, it's pretty stupid but at least it's different. If you are familiar with other vertical scrolling shooters like Zanac, Super Star Soldier or M.U.S.H.A. then you will feel at home with this game. You move ship, it shoots stuff, you get points! Gotta love that, eh? Of course like most good games of this type there is more to it then just that and the game is filled with lots of cool power ups. You can actually upgrade one of your 5 unique weapons up to 8 times but if you want to get the full effect you need the special Wing attachment. The Wing gives you more power but it also makes you a larger target for the enemy which is a great omage to the legendary arcade shooter Galaga. Each of the 5 weapons have their own strengths and weaknesses too like the '4' gun for example can slice through enemies but the range is limited and it constantly needs to be recharged while the '3' gun can home in on targets but has less power. Although Gun Nac is only a one player only game you do get some help on your difficult mission here. Before you go out on your quest to shoot stuff a friendly female shop keeper (who looks way too excited to see you) gives you 4 free bombs to help you clear up the screen of bad guys. The cool thing about these bombs is that you can upgrade them if you grab multiple ones of the same type to make them even stronger. With 5 different standard shots and 4 different bombs available the game is jam packed with depth. You can even buy more bombs, weapons, and even speed upgrades off the shop keeper as well but its gonna cost ya so be sure to grab any loose cash you find on the way. Will somebody out there tell me what the deal is with these stupid cats with coins here? One of the most unique things going for Gun Nac its strange visual style. You are up against everything from killer umbrellas to more serious solar flares of the deadly fires of stage 7. The game may appear strange but at least all the backgrounds are fairly detailed for a NES game. Gun Nac even gives you the option to have slowdown in the game or not. If the screen gets overloaded with too many enemies and bullets the game will slow down in 'Sprite' mode but amazingly the speed will stay constant if you just leave the options alone. 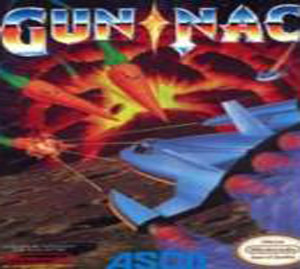 Normally if older shooter has some nasty slowdown in the game you just had to deal with it (just like in Super R Type or Gradius III for the Super Nintendo for example) but Gun Nac is so advance that it gives you the choice. I know it sounds weird but adding the slowdown can still help you in this hard game so don't knock it till you try it. The game's music is a little weird and wacky but it fits the overall feel of the title and each weapon comes with it own effects as well. What may seem like a goofy looking game at first (you're shooting robotic bunny rabbits in stage 1 for one thing), Gun Nac is still a really intense shoot em up with very good graphics, great music, furious game play and the title even has some of replay value thanks to the 4 different difficulties. This game is so good it reminds me of a lot like Blazing Lazers on the Turbografx-16, play it and see if you agree? Be a where however, that this game was a limited release so it's a harder find then most NES titles but it is well worth the extra effort. If you are looking for a underrated but top notch shooter with a ton of challenging action Gun Nac is your game! "Now be vewy vewy quiet, I'm hunting Wabits!" They look cute but secretly they all want to kill you. Find Gun Nac on eBay here!